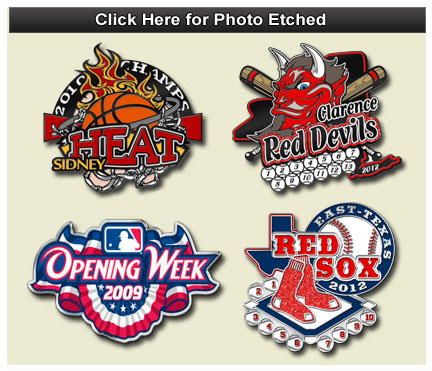 Trading Pin Junction - Custom Trading Pins for Baseball, Softball, Soccer, Football and Basketball Teams. Custom Little League and Cooperstown Trading Pins. Welcome to the home of all your custom trading pin needs. 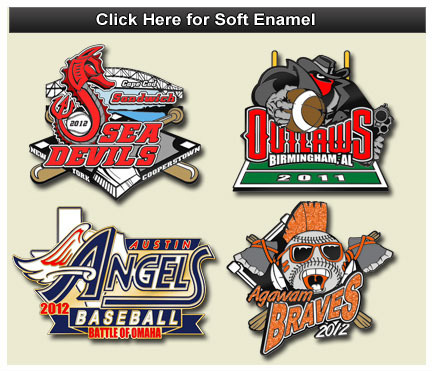 Custom trading pins show pride in your team. Custom trading pins show pride in your team.and reward your players for their hard work special and accomplishments throughout he season. Trading pins are an important part of the team experience. Trading pins promote teamwork and build relationships with competitors. Our customers have told us many times that the trading ceremony tends to be the highlight of the tournament and the kids thoroughly enjoy showing off and comparing their team designs with the other kids. Trading pins are like new age baseball cards. Players may spend entire afternoons looking at different pins before making a trade. A top quality pin may get two or three normal pins in return; the relative worth of a trading pin is described as "trading power." You can increase the trading power of your pins by investing in extras such as sliders, spinners, glitter colors, danglers, bobble heads, and single or double blinkers. Head over to our trading pin options page for more information on enchancing your pins with the extras. Let us make ordering custom trading pins as easy as possible. At The Trading Pin Junction you can count on free artwork, free revisions, free molds, free shipping to the US, and Free Quotes. You will generally see a proof within a matter of hours after submitting your information in the Free Quote form.